Another warm and wonderful spring day on Planet Edge. It was spent planting the accumulated purchases that have been stockpiled by Lavinia, in the way us acquisitive types tend to do. Her taste is of course impeccable, including the delightfully dark Penstemon “Blackberrry”, Achillea “Cerise Queen” (from experience more Boudica than Fairy), a yet to be identified campanula which could quite possibly be C. takesimana and a purple agrostemma. Seeds were sown of a white form of the Flanders poppy, Cosmos bipinnatus and Anemone multifida. 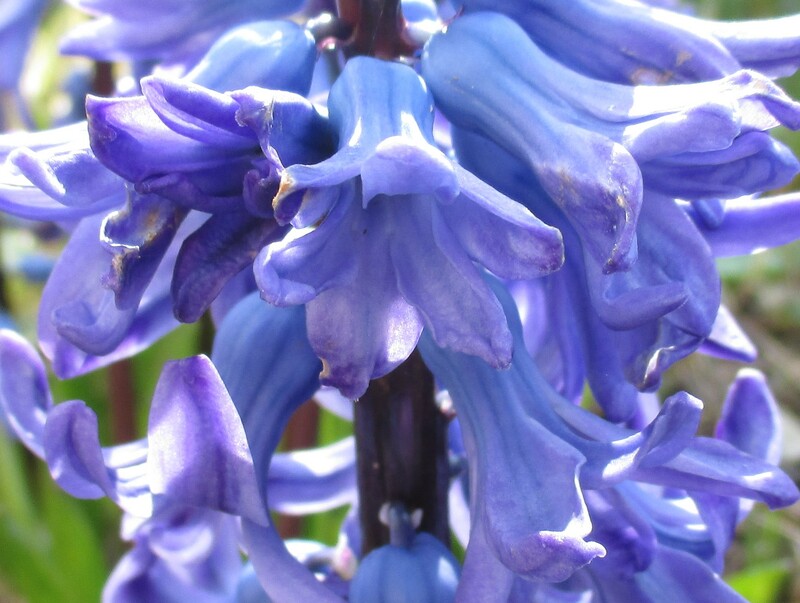 As I plied my trade in all four corners of the garden the scent of hyacinth, intensified by the gentle caress of the sun, was so heavy you had to push your way through it. Diverting, sometimes over-whelming and definitely intoxicating. Well it put a daft smile on my face anyway! I usually buy potted hyacinths towards the end of winter; as you said the smell it is intoxicating in the house. It serves as a drug to help us reach the spring time! Gorgeous photo, purples and blues and spots of light. Mine too! I used to grow a patch of hyacinths directly under my south-facing kitchen window so that the lovely fragrance wafted up as I washed dishes. Have to confess that in the house they can be (like Oriental lilies) just a bit overwhelming but in the garden it is delicious. One of my favorite cvs is ‘Top Hit’. I’ve planted 50 or more hyacinths in pots this year. They are all outdoor ones, not prepared bulbs, so have a few weeks to go before flowering, especially in this chilly weather!